I welcome you all to our Annual General Meeting , it is always an important night for the Club. Firstly, might I briefly go back to this time twelve months ago when John Joe McCormack said to me “The Time will fly – how right he was”. In my brief address to you at that time I said “My wish for you all is that you will have a happy year’s Golf”. Well I cannot speak for you obviously but personally speaking I can only say I had a very happy year as Captain of Tipperary Golf Club. There are many reasons why I enjoyed my year so much , but each and every one of you played your part in it. Pride of place however must go to my Committee and all my thanks go to them. We worked exceedingly well together and had no trouble whatsoever at Committee level or at any Committee Meeting. In addition, they all performed superbly well at Sub Committee level and I am going to review the year mainly by having a look at each of these Sub-Committees. Course : The big event here was the opening of the new greens on May 30. It was my privilege on that day to pay tribute in particular to the work of John Butler and I now do so again. I would also like to express my thanks to John McHnrey , Tom Corridon, Denis O’Sullivan and of course Arthur Pearse. Games : In my opinion everything here was dealt with in a highly competent manner. Every effort was made to pack the maximum into the golfing time available . The competition and games surplus was up by E1544, that figure alone speaks volumes for the work of the Committee. Handicap: Not the most popular of Sub Committees but I think the lads did an excellent job – they had the difficult task among other things, of introducing a new standard scratch system but today everything has been going smoothly, no problems they tell me. However, the best proof of the outstanding ability of this Committee was the fact that the Captain’s handicap was only reduced by 1 stroke during the year. Bar & Pavilion: I am putting these two together as their work overlaps. The big achievement was the introduction of food – if I may put it that way to the Club, the purchase of a Toaster, the introduction of the sandwich and the purchase of a new Water Heater to make a make a better Cuppa. We also ” have a new Cash Register and Television. There obviously is great potential for development in the food area but the important thing is that the boys made a start. I would also like to thank all of the members who helped and worked in the Bar during the year. Social: Another difficult area but what an effort this Team made. I am sure the others will not mind but I would like to single out John Pierse and Pat Donovan for special mention. They put a power of work into building up the Social scene once more and I think they achieved that recovery. I think at times they were a bit disillusioned with the support they received but they brought back a new spirit to the Social Scene even if the financial results did not always measure up. I am also most grateful to the Cards Team who did an excellent job for so many weeks around the Christmas time. Rules and Procedures : This was a gigantic task and I am particularly grateful to this Group. They studied rules from a number of Clubs, extract what was relevant and best as they saw it. It was a tough often monotonous task but they stuck at it and I am sure you will agree that at the end of the day they produced a booklet worthy of the occasion. Officers: I would like to say a special thanks to last year’s Captain John Joe McCormack who gave me so many useful hints, the Vice Captain Tony Merrigan and the Secretary Padraig O’Donoghue One as inexperienced as I was just could not have survived without the help of these men, the help came in a very special way, the gentle hint now or then what to do or what not to do and when to do it. I am also thankful to our other officer Pat Hanafin like myself he came in comparatively inexperienced at Committee level but did a great job. Think Tank: This was a type of sit in by the Committee , a free for all where new ideas were concerned. Unfortunately, the bad bout of ‘flu which I got myself upset these meetings as they were most enjoyable and provided a lot of excellent ideas. Many of them related to catering, small on course improvements, entrance improvements, new social events etc. I think it is a Committee which could be usefully continued during the Winter months. I would also of course like to thank our Sponsors, many of them are personal friends of my own. With one or two exceptions, what I might call Sponsor: Nights were again poorly attended. This is a major problem as it is positively embarrassing to find 12 or 15 people present on the night that Sponsors come out for the presentation having put their hands in their pockets to the extent of £200/£250. I was also disappointed that on two occasions during the year when winners were coming up to receive their prizes, they did not address the Captain at all, they may not have liked the man in the position but not to address the office of Captain in the first place is an insult to the said office. Re Sponsorship in general I would have two strong recommendations , firstly that they take place 9/9.3O a.m you will note that they Sponsor themselves are always out early and that all Committee Members male and female should attend. 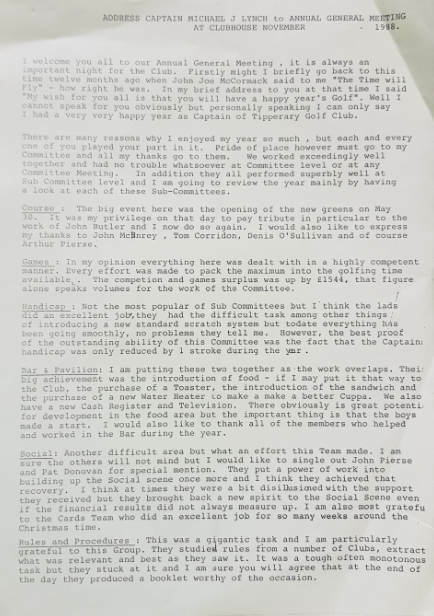 There were many great highlights during the year such as the visit of the non playing Captain of the Irish Team Eamon Curran, I was somewhat disappointed with the attendance on that historic night, then there was the opening of the new greens, the introduction of food at the Bar – at last – the Ladies great win at Mallow, the improvement of the entrance, but abo all there was present what I mentioned at the outset of my address namely a great spirit of co-operation. The year unfortunately also brought the death of one of our great members and a former Banking college of mine namely Paddy Connolly, God rest his soul. As I came in may I go out namely that I now wish you all many happy years of Golf. I would say to you also learn to look at your Club from the outside, don‘t get locked in as it were, when you would not be able to see the wood from the trees. You have a great Club, great Members, with enormous future potential – continue to work for the good of the Club.